With all the traveling, shopping and baking, the holiday season can quickly become overwhelming. We certainly know the feeling. That is why we want to take some time out of this busy month and say thank you to all the hospice and home care workers. Before Thanksgiving, we started our blog series discussing National Family Caregivers Month, this week we are exploring the history and importance behind National Home Care and Hospice Month. National Home Care and Hospice month, founded by the National Association for Home Care and Hospice (NAHC), is a nationally celebrated month dedicated to raising awareness about the highest quality care for all people coping with life-limiting illness. According to statistics reported by the NAHC, nearly 1.6 million people with a life limiting illness receive care from hospice and palliative care providers in the United States each year. In 2014, these services were provided by roughly 12,400 home health care agencies. That means each agency helped an average of roughly 400 patients each year. That may not seem like a lot, but when you consider all the time it takes to provide quality care and training, it truly is amazing. 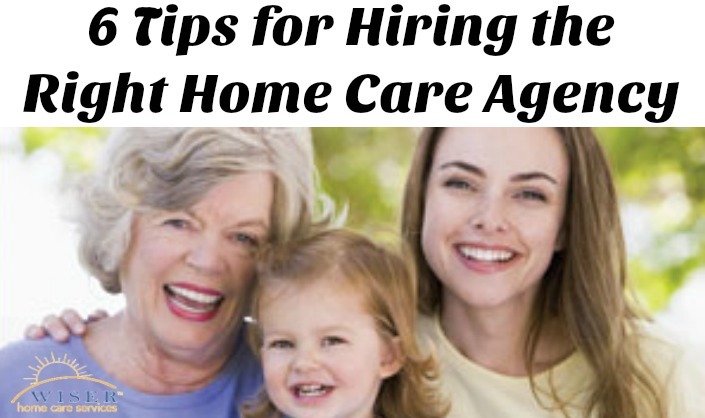 To help in raising awareness of these amazing services that Wiser Home Care and many other Home Care agencies provide, we have gathered 6 tips for finding and hiring the home care agency that best fits you and your loved one’s needs. Each home care agency is unique and offers unique services. Before you even begin your search, it will be helpful to know exactly what type of care you will need. This will help narrow down your search. We know it can be tempting to hire a home caregiver directly, instead of going through an agency, but it can be dangerous. While hiring them directly may save you money, you will be tasked with all the responsibilities of an employer, i.e. hiring, firing, background checks, certification checks, oversight and more. The last thing you need when you are faced with having to hire home care services is more work. When you work with an agency, the agency will cover finding a qualified caregiver that is a good match for your needs and they will have backup care in case something happens. It protects you and your loved one. Even if you hire a caregiver through an agency, it is your right and duty to request that the agency provides background and certification check guarantees. This will provide you peace of mind that your loved one is getting the best care. Another great question to ask a potential agency, is about what kind of continuing education and training they provide their caregivers. After all, you can’t provide the best care unless you stay sharp. Before you come to a final caregiver decision, you should ask the agency to introduce you and your loved one to the caregiver. Sometimes they seem great on paper, but face-to-face it could prove to be a bad match. If it is a bad match, don’t worry, the agency will find another caregiver for you. Once you find a caregiver that is a good match, ask for their references. Before you agree to an agency or caregiver, make sure you discuss billing procedures and get it all squared away. Private medical insurance and Medicaid often only cover certain types of care so it is better to be aware of that before you have any billing surprises. Every step in this process is critical, but quite possibly the most important step is developing a comprehensive care plan with the agency and caregiver you decide to hire. This plan will outline all the tasks the caregiver is expected to complete as well as how the agency will track the progress and completion of each care step and make sure that nothing is overlooked. We know that hiring a caregiver/ home care agency is extremely stressful. Please do not hesitate to contact us. We will answer any questions you have and be more than happy to guide you through each step of the process. I’m so glad you talked about the importance of assessing your needs before you start looking for a home care company. It makes total sense to think that doing this can help you save a ton of money and time as you look for the best services to help take care of your loved one. My grandma is getting to that age where she needs help with a lot of things at home but refuses to move to a nursing home, so we want to find the best home care services in the area.